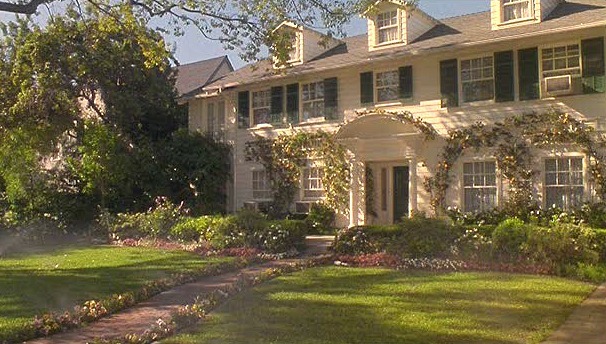 The House and Nursery from "Father of the Bride 2"
Last week I featured Steve Martin’s traditional white house from Father of the Bride, so I thought it would be fun to take a look at how it looked in the sequel, Father of the Bride Part II. 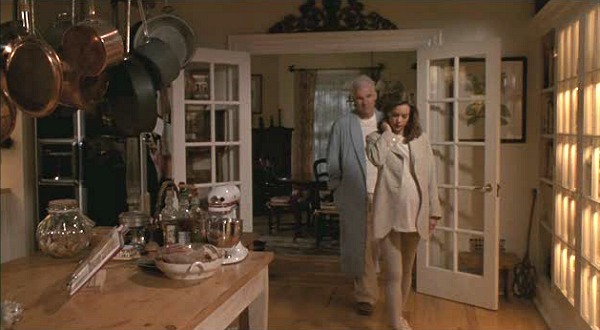 In this movie, the camera spent more time lavishing attention on the house and giving us a better look into some of the rooms, like the kitchen. Oh, and the baby’s nursery was a wonderful addition–literally. Annie and her mom are both hugely pregnant. In one scene they both looked like they had beach balls under their shirts and Steve Martin narrates that they were only in their second trimester. Yikes. Those are big babies! Nina’s (Diane Keaton’s) pregnancy was a little hard to believe. She was 50 at the time and reportedly refused to play pregnant after reading the screenplay. She thought it was a little too ridiculous. 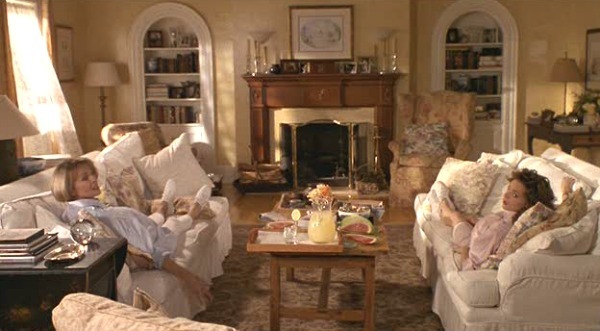 Nancy Meyers (who co-wrote the script with Charles Shyer) and Keaton’s co-stars had to talk her into it. We didn’t get to see nearly enough of the kitchen in the original film. More time was spent in it this time around, and I was able to get all sorts of angles. I noticed the main thing that changed from the last movie to this one is the tile backsplash. It’s now neutral and beige. Remember how it looked before? George says his house is the “Leave It to Beaver house that everybody wants.” Ain’t that the truth. Here they are, saying a weepy farewell to “this run-down old shack,” as George calls it. They pan up, the music soars, and the place looks as gorgeous as ever. There’s even a rainbow! 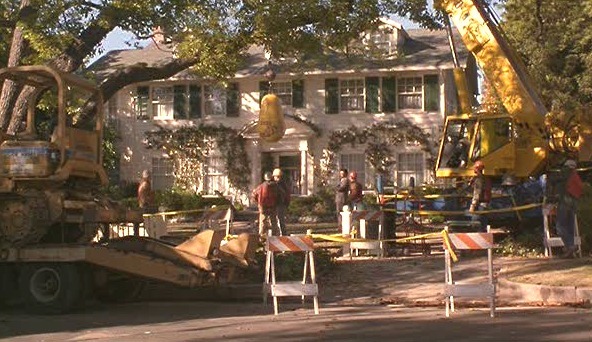 George stops the wrecking ball and pays to get his house back. 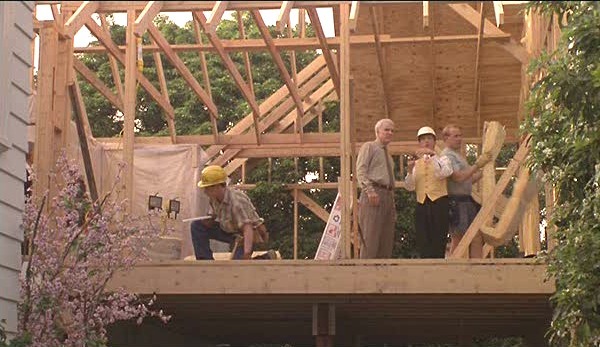 They move back in and start building an addition for the baby’s room. 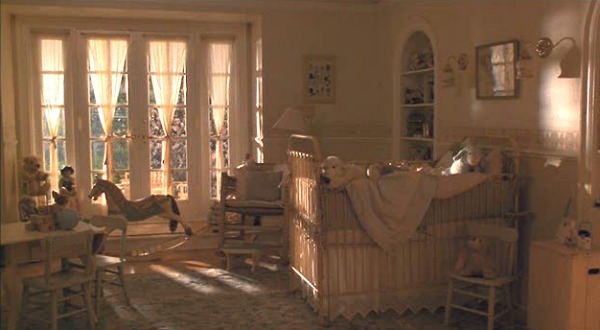 I’m not sure why they were so short on space that they needed an entirely new wing for one little baby (couldn’t they use Annie’s old room? ), but let’s just go with it. This has to be one of my favorite movie houses. 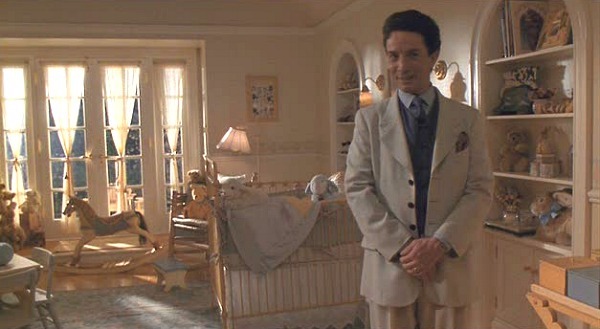 You can see more photos of it and see how it looked in the first Father of the Bride movie. Two houses were used for filming in this movie, and one of them is for sale, so check that out, too! Meg Ryan's Brownstone in "You've Got Mail"
Loving the house, I would love to be swinging on that hammock & I will definetly be having a picket fence one I start building its so cute. TheOld PostRoad’s last blog post..Everything Etsy!! I’ve probably seen both of these movies at LEAST 100 times, as it was always my “feel good” movie to pop in. I suffered from post partum depression after both Annie (named after Anne Elizabeth in the movie) and George (Hunter) were born. The movies kept me sane I tell you! Thank you for featuring this! That was some serious attention to detail. Awesome. Ann-Kristin’s last blog post..Country Living Giveaway! I actually watched both those movies last night. What was with Annie’s eyebrows in the original?? They looked like she rubbed them with charcoal, lol. Love that house and still crave butcher block countertops!! Sigh. Love it all. 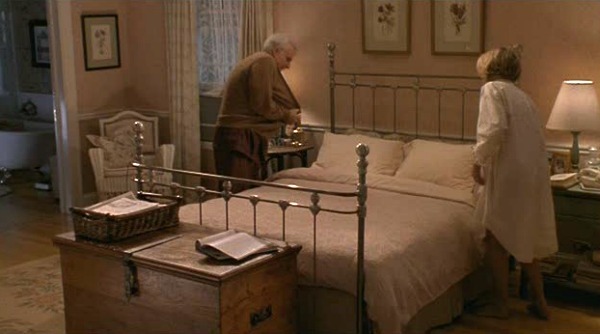 I noticed that George and Nina’s bed is surprisingly un-plush and plain looking compared to everything else. But in that same photo you can catch a peek at the clawfoot tub in the master bath. Drool. 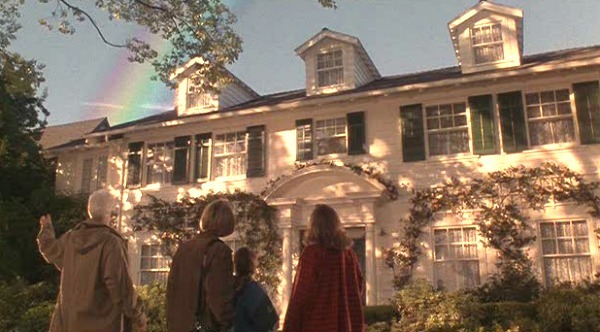 I loved that movie so much, and I love that house. Thank you for showcasing it today! I always loved that house, inside and out! Thanks for all the information! (sigh) I love that house and those movies. My mom decorated like that back then, so maybe that’s why it feels so homey to me. This house is so amazing! Could you imagine having that nursery?? Total eye candy, thanks for a great post! Michelle’s last blog post..Yard Sale Cabinet Redo and….100!!! That nursery is so pretty! You are right, that is great decorating for the 90’s! Jenny’s last blog post..I ? Faces Week 24: "Let’s Hear It For The Boys!" 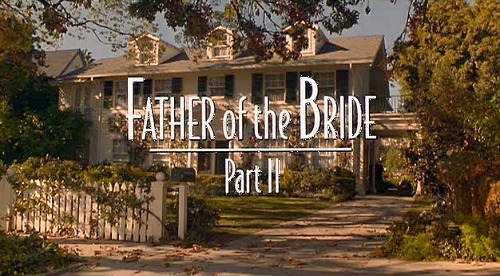 We watched the original Father of the Bride and Father’s Little Dividend, last night. It’s interesting to see the similarities in the houses and the differences. 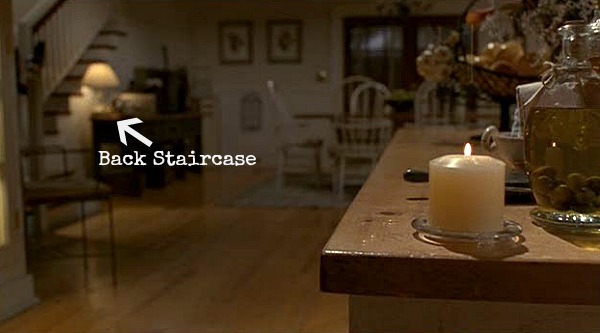 I absolutely loved this house and watched the movie several times because I loved it so much. Thank you for the stills, it lets me look more closely and yes, I love it even more now. That nursery has always been swoon-inducing for me, moreso than the rest of the house, simply because I’m not a fan of Colonials. I do agree that they had plenty of room for the baby without adding on! Annie’s place, on the other, hand, is just my style! I loved that hammock in the movie and I still do! I also loved this house from the beginning. 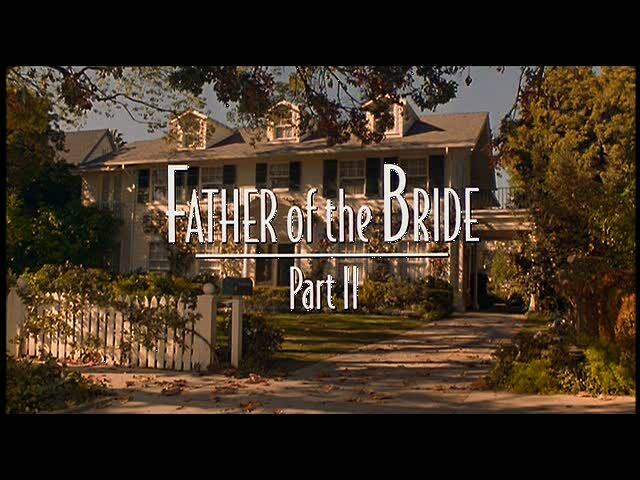 The 1st movie came out when I got married, and the 2nd one was when a was first pregnant. So this movie has a soft spot in my heart…..
Suzy’s last blog post..The Great Gift for a Great Teacher! 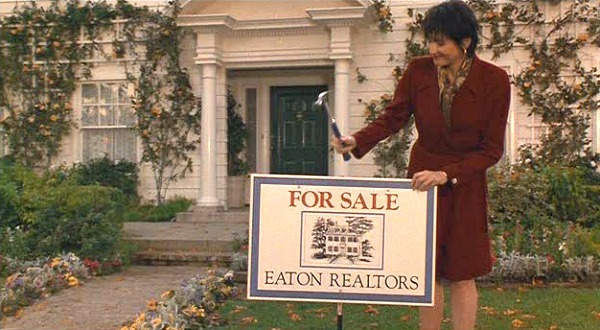 Love this house, love this movie, love diane!!! lovely post! This movie has long been a favorite, but the house has been an even longer favorite! THANK YOU for doing such awesome shots of it! And the lit-up glass-front cabinets in the kitchen? Never noticed, but I love it! Thanks for pointing it out. What I thought was funny is that when Annie and Nina are almost ready to deliver, they only weigh in at 128 and 132, respectively. I would like to know who only weighs that much when you’re 9 months pregnant – I know I sure didn’t! I adore this post, as I do all of your posts! But with the movie houses, I realized about 10 years ago that I watch movies so often to be “tickled with joy” by the houses…I watch them over and over and over…the movie Bewitched, I paused a dozen times trying to see everything in her adorable little cottage…thank you for doing this. I always leave here with a tickle! 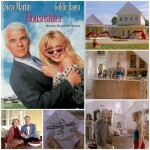 Hi Julia — I love your movie house posts! 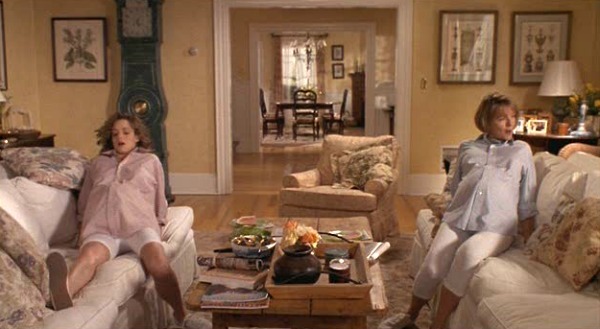 I’m so glad to find out that I am not the only person who looks at the decor of movie and TV houses; maybe now my girls can stop teasing me about it! I was watching “The Divine Secrets of the Ya-Ya Sisterhood” the other night, and had to back up the DVD — in one scene was an exact table lamp that I had bought for 9-bucks on Ebay and my Dad rewired. Stuff like that just tickles me no end. 1. The architectural plans that you posted are not the same as the interior shots. Were the interior scenes a set or were they done in a real house? Are the plans only for the house that was used for the exterior shots (excluding the basketball scenes)? 2. Where did they add the “Baby Suite”? Is that really an AC unit on the 2nd floor to the right? No central air in that gorgeous house? Love the details though!! .-= domestic diva´s last blog ..We HEART Tory Burch!! =-. There are three dormers on the third story in the last photo on this page, on the original house they are not there? Did they just add fake ones during filming or do you know? My interior design teacher was working for the company that provided all the decor for the nusery, and was on set to help dress it! I about died when I found that out! I am so jelous…this is one movie set that I wish I could live in permanently! 🙂 Thanks for this post! .-= Amanda´s last blog ..Five! =-. 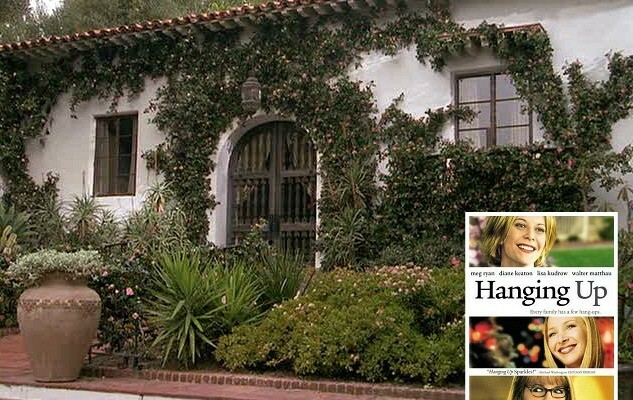 Does anyone know where Annie’s house was filmed? OMG!!!! We found two bar stools for sale on ebay in South Florida….and they are the exact stools used in the movie that Annie is sitting on when she has the job transfer talk with George…WOW, so cool. the first house doesn’t have any windows on the roof. 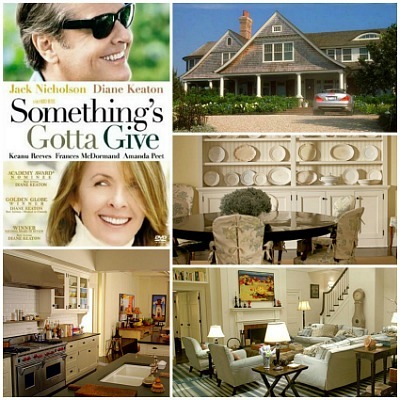 Thanks so much… I have always loved that house! 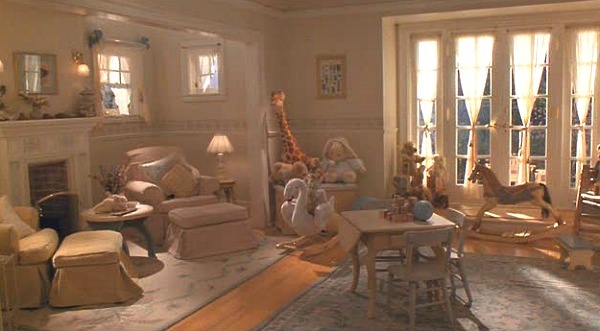 It’s hard to tell with the differences in the lighting of the scenes, but it seems that all the rooms are painted the same color, what color would you say it is is? It’s for sale for $1.35m, a price that really doesn’t seem that bad for a house that size in Southern California. 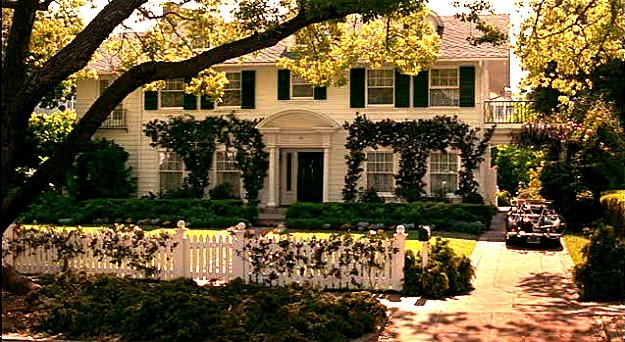 I love the picket fence too! Maybe when I finally get a house. I love the sitting area in the nursery. The windows next to the fire place. Has a cottage feeling! Any chance you may know who made the patina colored floor clock in the living room or where one could be purchased?